All transactions are safe and secure with a reliable history in online purchasing behind each of our associates. Buy the Superman Torn t-shirt to own Superman clothing and merchandise. Whether you attend Smallville High School in Smallville, Kansas or you write for the Daily Planet, this stylish torn design will get everyone's attention, even Lois Lane's. Pair it with a cool Smallville t-shirt for the perfect gift. Wear this tee as you reminisce about the days you spent researching articles for the Smallville High Torch, while at the same time trying to manage the drama in your life. Match this tee with a stylish Superman hat. 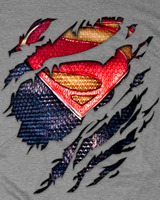 In addition to the Superman Torn tee above, browse the Superman Clothing Gallery for more apparel like men's and women's clothes, kids shirts or hoodies.